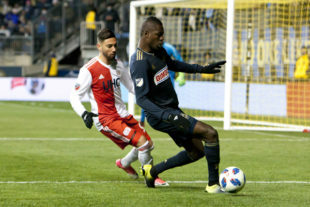 The Philadelphia Union turned that debacle into a dismantling of the Chicago Fire in the U.S. Open Cup semifinal, a win against the New England Revolution (that marked their 3rd win in 4 away matches), and the team’s biggest win of the season (and perhaps most impressive team performance in franchise history) against New York City FC. Even Chicken Little thinks this might be a playoff team. But said pollo piccolo knows that, when 10 matches remain in the MLS season, the next one is always the most important. Particularly when it’s effectively worth six points. As the saying goes, “It’s squeaky bum time” for the Revs (and everyone in the Eastern Conference not from New York, Atlanta or Columbus). Having already lost twice to these Union in 2018, Brad Friedel’s side will certainly come out with a little extra verve and guile, needing to catch a point or three this time around. As the skipper said, “The next 10 games are like 10 cup finals.” Right he is. Defender Michael Mancienne joins the Revs from Nottingham Forest. Considering both of New England’s center backs were sent off the last time these teams met in Chester, this might be a step in the right direction. He won’t do much to help the Revolution press, but expect them to live and die with the attacking half of their side within spitting distance of the Union’s goal line. Should they stop the Union’s “flow,” (as Bobby Warshaw put it,) they might just have a chance. Beating a team twice in one season is hard. Beating them three times is even harder. Doing the latter while also winning three successive league matches for the first time all season is hardest. Perhaps crossing these thresholds aren’t quite passing through the Gates of Mordor, but they are the metaphorical mountain that the Union face on Saturday night. The point? Even the greats have a hard time being great every time. Thus, with the Union’s aforementioned “Best. Performance. Ever.” now behind them, even the optimists still need to see the second act to know for sure the first one actually happened. Though they may be the flavor of the week right now, Philadelphia Union have played average soccer over the course of the season. Their record says as much, with 10 wins and 11 losses, 34 goals for and 39 against. Their recent string of results might suggest progress in the right direction. However, recent history for the team suggests the string of results is more akin to flipping a coin three times and getting heads for all three. Mean, meet my friend, regression. What fans saw from the Union last week was real, wasn’t it? The possession, the poise, the aggression, the artfulness, the mettle, and the mastery… frankly, it was surreal. It was sublime (the Long Beach legends who made the mandatory-in-every-college-freshman’s-CD-collection “Self Titled,” and the made-to-look-like-a-bootleg-when-it-really-actually-is-just-a-low-quality-bootleg, “Sublime Acoustic: Bradley Nowell & Friends”). It was inexplicable beauty in the form of first division American soccer. Love is fleeting, nothing lasts forever, all good things come to an end, and only fools rush in … but fans are standing outside of Talen Energy Stadium, boombox in hand, wanting the love of their footballing lives back. Will the Union oblige? Good article, I predict a win. Though they will drop some future games, I think the team has gelled and certainly found a scorer for the moment in Burke. I enjoyed all the music references as well, and the closing Say Anything! I think this is one the Union will win. The bigger questions come Wednesday in DC and a week from Saturday in Orlando. If they can get 4+ points from those two games they should be in really good shape. Friedel is the weak link in that team. Curtin should be able to outcoach him. First time I have ever seen that second sentence written on any website in his tenure. He’s improving. Last year he could often come out with a better plan then the opposition coach. Now he appears to be able to make decent in game adjustments. With hindsight it is easy to 2nd guess him, but I think he is learning. Still a relatively young coach. If you get the result you expect you learn nothing, if you make a mistake hopefully you learn and improve. Chris: You pulled me out of the shadows with this article. Had to simply say thank you… that was some engaging stuff from start to finish. Thank you. That’s really kind. What is the take here on what we do on the wing? Obviously Fafa starts when not suspsended, but what about the other side? I’ve liked CJs play on the wing. The issue is theirs no backup forward then. The two of them will run down. And we have a logjam of wingers. Ilsinho has played well and Accam is banished slightly. It’s an interesting problem to have. For my money I would start Ilsinho and let Sapong come kill off a game whether at forward or wing. It’s a great question since we have 3 games this week. A normal week and I’d say CJ starts on the wing and there is no issue. We do also have a week off after that though. I’d probably go for the full squad on the weekend and let the DC game fall is it may. Although would have to see how the games play out. Maybe we can get up a couple goals one of the games and get guys out a little early. Marcus Epps is a forgotten man. He was really good for a stretch this year. He played Wednesday for Steel, maybe next Wednesday for Union?